I’ve always been a firm believer that real cinematic horror doesn’t stem from axe wielding loons, supernatural exorcisms and cheap, jumpy frights, but from distortions of reality, ventures into the dark, often surreal depths of the human psyche and existence. Richard Ayoade’s second feature length effort is a black comedy that astringently mocks the overblown bureaucracy of modern existence by etching a harrowingly surreal world influenced exponentially from Hitchcock to David Lynch. 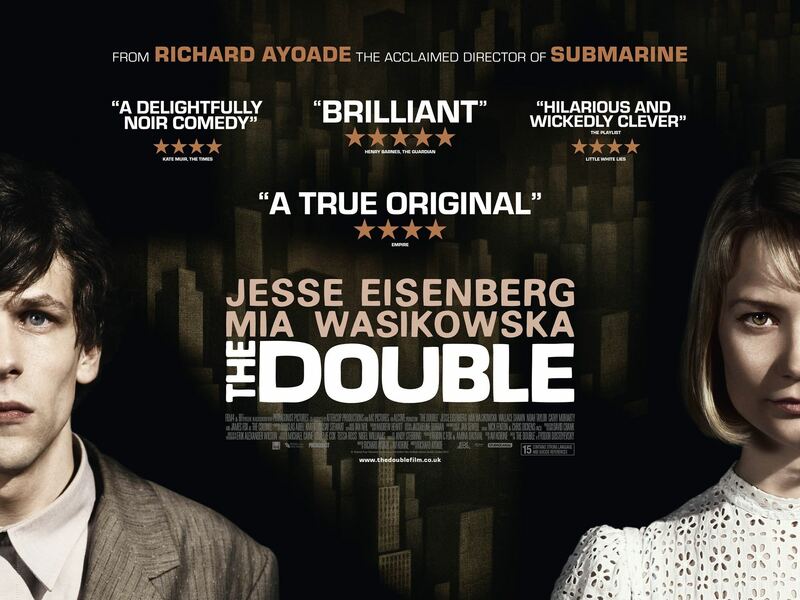 Taking its name and story from the Dostoyevsky novel The Double is about the simplistic yet nightmarish notion of having an exact double, a doppelgänger, in the film’s case the unfortunate recipient of this second manifestation is pathetic, insignificant and depressed office worker Simon James (Jesse Eisenberg). On one uneventful day on the job James is confronted by a new employee in the form of dead ringer James Simon (Jesse Eisenberg), while he may be aesthetically identical he’s everything James isn’t- brash, confident, conniving and a lady’s man. The office’s soulless workforce fail to match James’ shock at the double’s appearance, instead they indifferently accept the duo yet, somewhat contradictory, are unable to tell them apart meaning James and Simon can form an unlikely partnership as brains and brawn for mutual benefits. As James’ office crush Hannah (Mia Wasikowska) becomes entangled in their double act the fragile alliance begins to crumble, the unscrupulous Simon becoming more brash and dangerous. Rather than keep the 19th Century Russian backdrop or promote The Double to a definitive 21st Century, Ayoade places the film in a nomadic, darkly surreal world. Gloomily lit by noir-esq strokes of mustard coloured light, the world James resides in is a stylistic hell reminiscent of Eraserhead’s bleak industrial prison- there’s no sunlight or outdoors, just a phantasmagoria without escape. James’ squalid apartment is matched by the claustrophobic office he’s shackled too; the distorted exaggeration of menial, mindless desk work is so vivid and horrifying it’s a wonder how James and audience alike can survive the dreary domain. The whole set of The Double is a mesmerising netherworld, the fine balance is struck between a hyperbolic bizarre and a relatable off centre reality. Just like Lynch’s small-town in Blue Velvet or A Clockwork Orange’s parallel 1960s, everything is wholly recognisable but uncomfortable different. James’ apathetic drifting through his daily routine could easily be explained as somnambulist living nightmare, an accumulation of our worst fears. Just as the sets convey an unsettling bleakness so does everyone encountered in The Double, the narrative is strongly Kafkaesq in how it draws on fears of unstoppable isolation, impending doom and absurd bureaucracy governing our lives. James life is ruled by red tape, is very existence isn’t recognised by the officious office security (Christopher Morris) as he’s handed the impossible situation of needing his lost ID to be put on the system but needing to be on the system in order to get a new ID. It’s impasses such as these, matched with consistently bad luck in every aspect of his life, even the waitress at the café rejects his menu requests, that makes The Double the perfect manifestation of life’s grating issues that stop us from controlling our own destiny or simply ordering a coke. The film’s slow pace heightens the sense of terminal boredom in James’ world, each out moment of misfortune uncomfortably lingers on the screen. While The Double is dark, unnerving satire on our inconsequentiality and arduous life it’s a surprisingly witty film pasted with darkly dry humour. James’ unstoppable misfortune is predictable but entirely relatable comedy, a case of needing to laugh to stop yourself from crying. The absurdity of it all is so over the top that sniggers and laughs permeate the dark atmosphere, the appearance of comic aficionados Wallace Shawn, Paddy Considine and Chris O’Dowd aid the process. 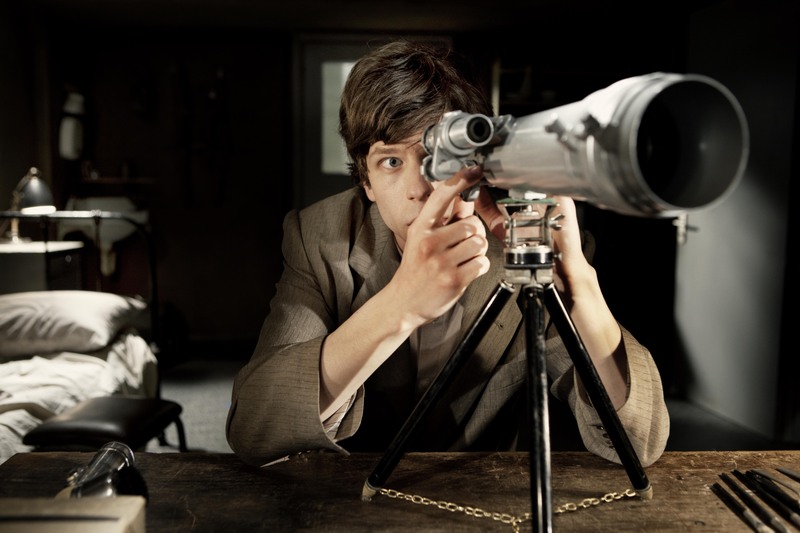 Protagonist Jesse Eisenberg fills James’ overly capacious suit impressively, his niche as the unconventional, reluctant protagonist is perfectly suited for him. His dark sunken eyes and pale pensive face convey pure apathy at his situation without sinking into an irritating wet blanket; the audience can understand the world won’t allow him to take a stand even if he could muster the strength. The role of the double, Simon, is to play devil’s advocate as a literal manifestation of the outgoing, successfully alter ego most of wish we could call upon. Eisenberg’s role as the increasingly malicious Simon isn’t as suitable; his vaunted persona less convincing than the shy James but adequate enough to fill the illustrative contrast needed. 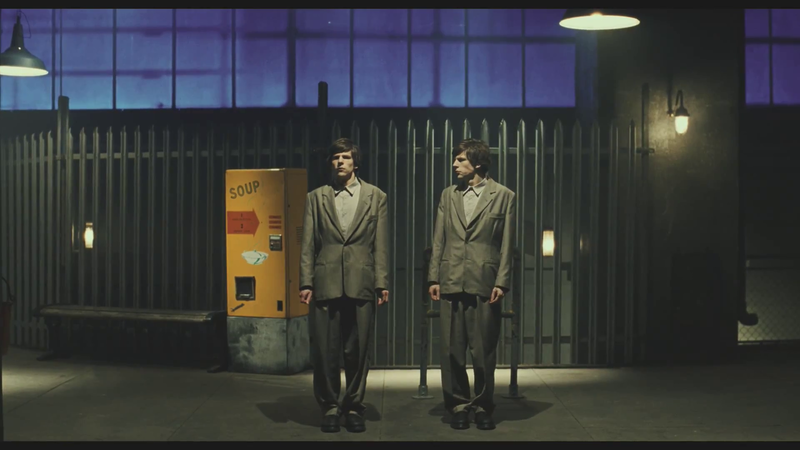 The Double’s premise suffers from a touch of banality from its use in prior films (Dead Ringers, Stepford Wives, The Tenant etc) meaning the themes concerning isolation and all-encompassing administration, the Kafka elements, are much stronger than the tangential furore in to alter egos, real or mental. Other criticisms can be levelled at the weak, compulsory love story in the mix, the fact it never takes centre stage and is between pushovers makes it a soppy, uninteresting one. The stern emotional commitment required for the romance is dragged back by the off the wall scenes and comedy, luckily the latter provides more value to The Double than a fulfilled love. Fears over being replaced by a supremely better version of ourselves has been a staple part of film narratives, whether it be literal like in Invasion of The Body Snatchers or metaphorically in Black Swan, and here The Double successfully adds to the genre via its distinctive, surreal, style. 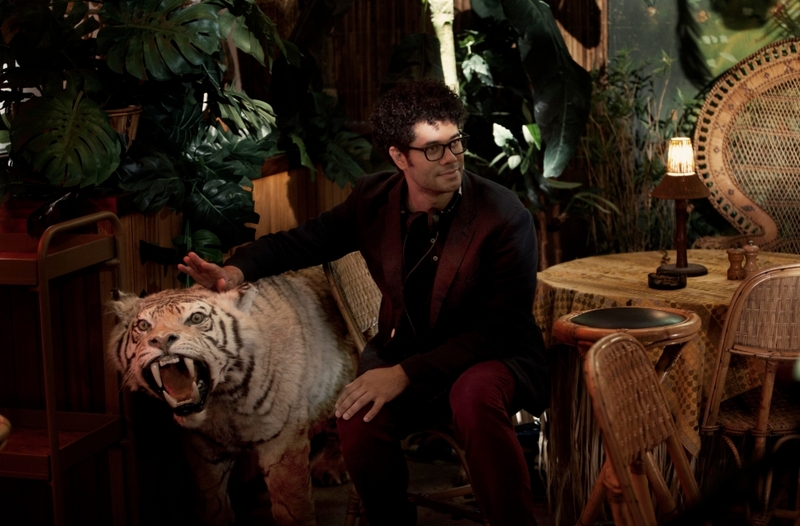 Richard Ayoade is one of Britain’s most exciting young directors, while he’s cemented his burgeoning auteur status with The Double’s distinctive, nightmarish vision it’s easy to spot the numerous cinematic influences that have shaped his vision, hopefully Ayoade will outgrow his pigeonholing as Moss from the It Crowd now.